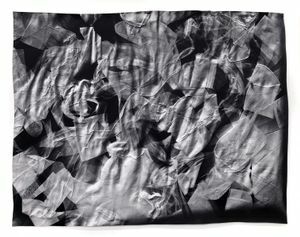 The strength of a photogram is that it physically meets its subject and records that touch, the mark of an interaction. Photography, throughout its short history, has been modeled after the vision of an eye; a lens opens to record the light reflecting off of the world around it. By subverting this intended use and making touch more primary than sight, I urge my already antiquated medium forward – asking it to transcribe texture, pressure and force - to read the surface of the world in a new way. 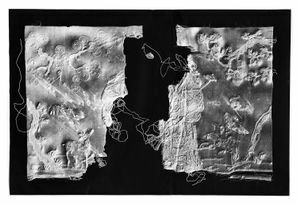 I use simple materials – analog light-sensitive paper, my hands, a flashlight and sometimes an etching press – to make “photographic rubbings” and “photographic reliefs”. 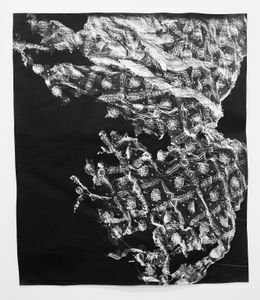 In darkness, I emboss the paper onto the surface of patterns from the landscape or artifacts of material culture and then cast light onto the resulting textures. This method of working feels simultaneously like reading braille, like prayer and like gambling. Risk, faith, and touching the unknowable are all part of my practice. This method is unruly, revealing nuance beyond what my eyes or fingertips can confirm and inventing new marks along the way: evidence of the friction and limitations of my materials. Yet, even when used in this crude and unbidden way, photography has a gift for describing the strange detail of reality. 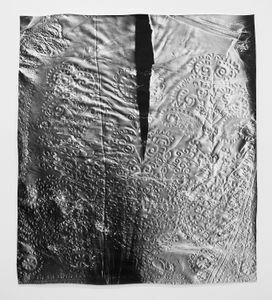 In "Generation" I apply this method to textiles and clothing from the last two centuries, objects rich in touch, from the labor of their making to the marks of wear. 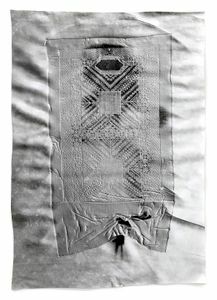 With each alteration, mending, and use someone has inscribed themselves onto these textiles. 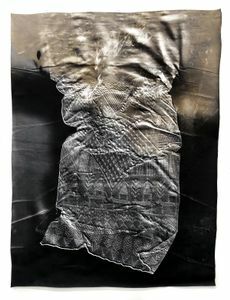 Just as each garment was made through the patient labor of one woman’s body, so is it undone that way, worn-down slowly, deconstructed, or cannibalized to make something new. 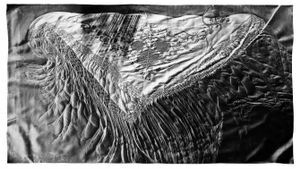 The history of textiles, of clothing and style is made up of a million stories of migration, cultural appropriation and women’s labor and sexuality. They each contain moments of aesthetic innovation and decades of ordinary devotion. 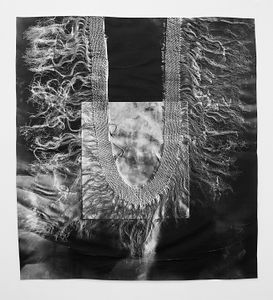 I begin by researching each garment’s origin, construction, intended meaning and broader representation, piecing together a possible history from the available world of text and images. This is a poetic form of research; simultaneously a inquiry into what one can learn from a physical object – history having inscribed itself on the material world – and an acknowledgement of how little I can know from this distance; how much these textures show only the surface of someone’s experience and nothing of it’s interior. My goal is to find a fracture, an insight that allows me to re-animate these objects and illuminate them. 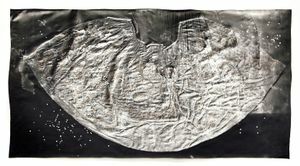 My inquiry is evidenced in "Legend", a printed journal that is a companion piece and key to these photographic reliefs. When amassed, this deluge of reference images becomes a visual history not of the textiles themselves, but of changing notions of femininity and ornament and of the West’s relentless appropriation of traditional fashion, patterns and symbols. It is a glimpse into a chaotic flowchart of influences, trends and the migration of objects that has shaped what women make and wear. 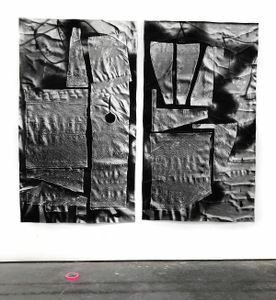 My process of applying pressure – even to the point of disintegration – is driven by a desire for haptic communication with a distant time and place.